Anyone who has visited Saligo Bay will have walked past the remaining concrete foundations, possibly wondering what the were for. 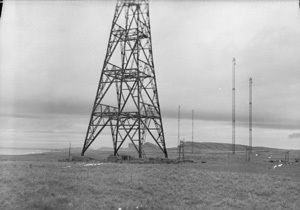 They were for the Chain Home radar station, the picture in ROYAL AIR FORCE RADAR, 1939-1945 shows how they once looked. I assume there aren't many pictures of it still in existence, it being a military installation I guess not many were taken for security reasons. Something more people will have heard of were the Sunderland Flying Boats, I blogged about them previously in Sunderland Flying Boat on Islay Video and collected a few links. 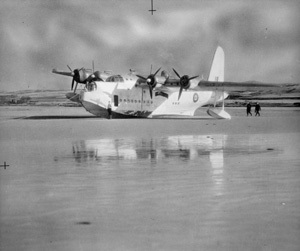 The IWM collection has two pictures of them on Islay online, one shows a Short Sunderland Mark II beached at Laggan Bay (preview on the left), the other one shows Sunderlands of No 246 Squadron riding a gale at their moorings at Bowmore in February 1943. There are quite a few more other pictures of the Sunderlands in the collection, from what I've seen in particular from Oban, not too far away from Islay. 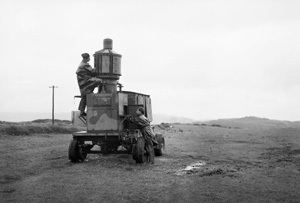 The last item to mention is a short film clip (in black & white of course) titled MOSQUITO CRASH DURING BOUNCING BOMB TRIALS OFF COUL POINT, ISLAY. Sadly both of the crew were killed in the accident, see also ASN Aircraft accident 25-OCT-1945 de Havilland Mosquito FB Mk.IV DZ579. Those two links are the only detailed ones I'm aware for the incident, not much seems to have been reported about it. Copyright: Pictures published under the IWM Non Commercial Licence.